Put two economists in a room and you might think you’re in for a snooze-fest. Today’s Wall of Shame honors are shared by three, but what they have to say won’t put you to sleep. It ought to scare you to death. Here Rugy celebrates what I’ll call the transgressions of economist John Cochrane in an interview last September on Uncommon Knowledge. This used to be a public television show, but is now simply a video series produced by the very conservative Hoover Institution at Stanford University. She needed to do a little more math. If the U.S. economy were to double every 14 years for the next century, that $18 trillion 2015 economy would hit $2,342 trillion. How does Rugy think we’ll power that? Where does she think we’ll put the CO2 and other waste products from that much economic activity? I’m sure she believes we’ll find substitutes for every scarce non-renewable resource, and – besides – we’ll completely decouple economic growth from resource extraction and waste production. That’s a serious case of optimism on which I’m not willing to bet my children’s future. If you, Rugy, Robinson or Cochrane want to catch up on realistic, science-based information about a sustainable economy, I refer you to the reading list at More About Limits to Growth. The Cochrane interview offers some very interesting ideas about tax reform. There may be some wisdom in there. But Rugy’s notion about the current White House’s intention to reduce regulation reveals a lack of big-picture thinking. She intends to pack a $2 quadrillion economy into the 50 United States, but doesn’t anticipate the need for MORE regulation, not less – just to keep the human inhabitants from being utterly crushed by the fallout of that much economic activity. Naïve in so many ways. So, here we have a column in National Review. It’s by a senior researcher at the Koch-funded Mercatus Institute (who formerly worked for the Koch-funded Cato Institute and American Enterprise Institute). It celebrates an interview produced by the Hoover Institution, with a Hoover senior fellow, conducted by a speechwriter from the Bush 1 and Reagan administrations. I’m just saying. These are growth propheteers working for the growth profiteers. (When you think about it, that is kind of like Disney’s Mouseketeers.) I could have predicted an economic growth and free-market love fest. And that is what we got. A very large grain of salt is in order. For more realistic ideas about a healthy 21st century economy, check out our upcoming webinar, Joy of a Steady State Economy. It happens at 9pm EST on February 15. Details & Free Registration Here. GDP does not measure standard of living. But it might be more accurate to say that GDP measures how hard people are striving to increase their standard of living. That is to say, GDP measures the effort but not the outcome. Thus, back in the 1950’s there was a plethora of new technologies that had obvious utility. There was also scope for rebuilding from the devastation of war. Obviously, people saw the possibility for improving their standard of living, so they made great efforts (high GDP) and those efforts were rewarded — reinforcing their motivation and effort. Thus to say that the US economy presently has sluggish growth in GDP is to say that people see little hope for an improved standard of living and so they have, quite wisely, stopped trying so hard. 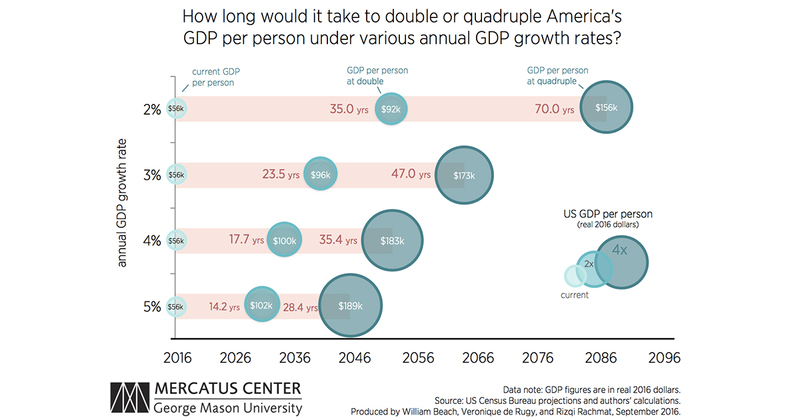 I’d be interested in what you and your readers think of this view of GDP?